Since it is the beginning of the year, my Bible reading program includes a chapter from one of the gospels each morning. Recently I finished Matthew and started in on Mark. 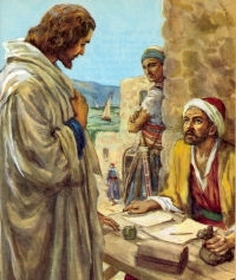 As usual, I was struck by the story of Jesus calling Levi, who held the despised position of tax collector. He says to him, as to the other eleven He called, "Follow me." Levi, (later to be called Matthew), got up and followed him. Then Jesus goes and has dinner at Levi-the-sinner's house, dining with him and other undesirables and drawing the disdain of the Pharisees for such unclean behavior. Doesn't He know with whom He is dining?! Well, in fact, He does. His reply to the Pharisees about why He eats with tax collectors and 'sinners'? It is not the healthy who need a doctor, but the sick. I have not come to call the righteous, but sinners. Surely hundreds, if not thousands, of sermons have been preached on this passage, highlighting various things we can learn about God and ourselves. Here is what stuck out to me: in every instance that Jesus calls someone to Himself, He is recorded as saying, "Follow me." He doesn't give any prerequisites and His authority doesn't demand that he give any explanation. He looks people in the eye, says Follow me, and they do! I want to respond in the same way, with this new refrain for my days, LEAD THE WAY, LORD! to respond, Lead the way, Lord! The way of the Lord is simply to follow Him! He does not expect us to be Him. Yes, He desires for us to grow in likeness to Him, but that is done in the daily following of our Savior. It is in the following (listening for His voice and guidance through our days) that we are transformed into people described by the love in 1 Corinthians 13: patient, kind, not envying, not boasting, not self-seeking, not keeping records of wrong, rejoicers in the truth, people who protect, trust, hope, and persevere. We grow in loving the Lord with all our heart, soul, and mind by following Christ. We grow in loving our neighbor as our self by following Christ. We need never run ahead, we need only to let Him take the lead. Since He is love, He will never fail us. So, whaddaya say? Will you join me in the refrain? Let's pray: Lead the way, Lord! Yes!!! Spoken as a follower.. looking to her leader!